Operating as a combined planning and zoning board, the Borough of Palmyra Land Use Board (LUB) is intended to: facilitate development of an appropriate mix of uses; protect, enhance and preserve our physical environment; conserve public resources; and shape our community’s character by implementing provisions of the Land Use Ordinance. We strive to enhance each citizen’s quality of life through long range planning by coordinating and guiding appropriate development. The LUB works with the residential and business communities to improve the quality of life and living environment through supporting sustainable growth. The LUB accomplishes this through maintaining and enforcing the provisions of the Master Plan and periodically updating the Land Use Ordinance. Working hand in hand with the LUB, the Zoning Official provides regulatory enforcement of the Land Use ordinances. It is through the enforcement of our comprehensive zoning, subdivision, and flood plan ordinances, as well as related Borough administrative codes, that we achieve our mission goals. The uses of land are regulated through a permitting process whereby applicants identify anticipated uses and structural setbacks and the department ensures compliance with the applicable codes. Formal written application to the Board must be completed and submitted at least 30 days prior to the expected meeting date. Fourteen (14) copies of the application and supporting data must be included. 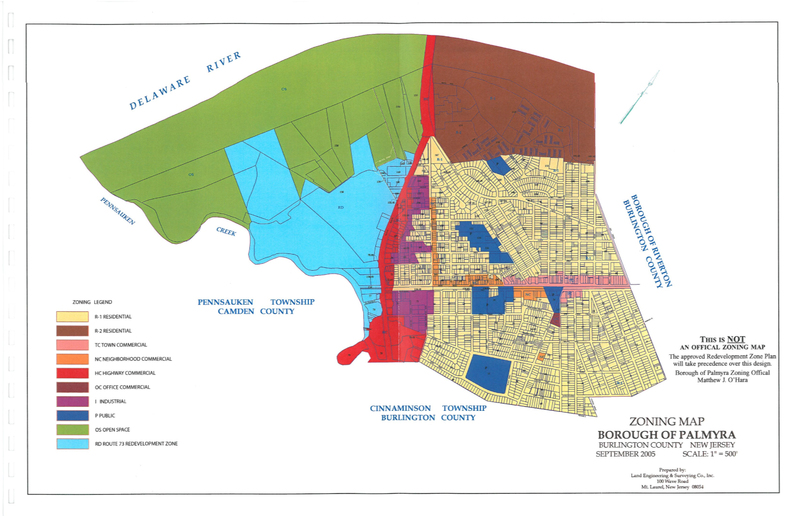 The Land Use Board of the Borough of Palmyra will hold regular monthly meetings at 7:00 PM at Palmyra Borough Hall, 20 W. Broad Street, on the third Wednesday of each month. Meetings are generally canceled if no new business or applications are scheduled. Please take note that no new business will be taken after 10:30 PM; should an application not be heard due to time constraints it will be tabled until the next scheduled monthly meeting. The Land Use Board may call additional meetings, upon approval; and action may be taken on non-application resolutions at the conference meeting.